Tulsa Douglas and Vortex earned their first D-III Championship in a rematch from pool play. Coverage of the Women’s Division of the 2018 D-III College Championships is presented by VC Ultimate as part of their season-long support of our women’s coverage. All opinions are those of the authors. Please support the brands that make Ultiworld possible and shop at VC Ultimate! 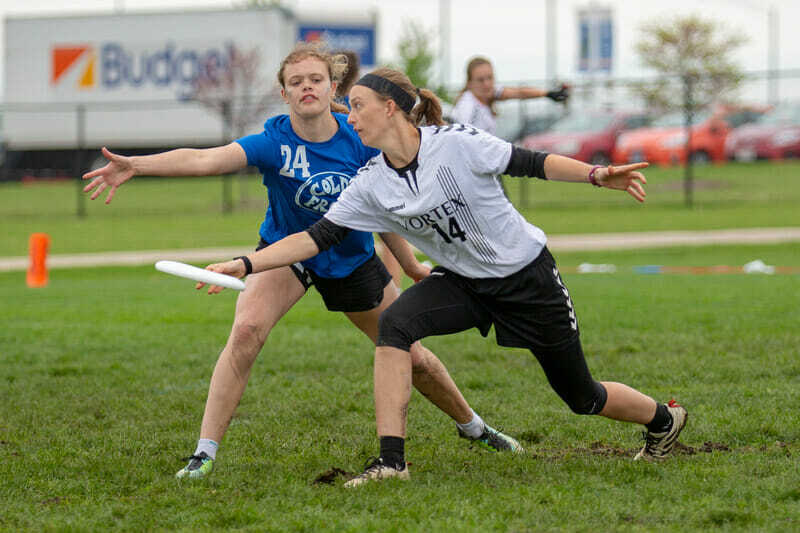 ROCKFORD– Sunday’s women’s Championship final game featured teams #2 Bates Cold Front and #7 St. Olaf Vortex, pitting two of the best handlers in the division against one another yet again in a rematch of the last round of pool play on Saturday. Where Bates had been victorious on Saturday, St. Olaf took home the title on Sunday, winning 11-8. In the 80 minute round–shortened due to a lightning delay and the fast approaching departure times of Bates’ flights back to Maine–St. Olaf played a more consistent game in the lower temperatures and gusting winds. Vortex effectively utilized the phenomenal handling talents of Tulsa Douglas, who contributed on both sides of the disc, and fellow seniors Aidan Zielske and Sami Peterson. 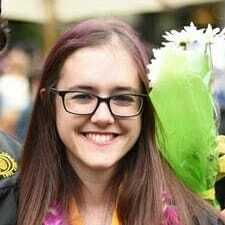 Bates also impressed with highlight plays of their own, primarily with the long game of Josie Gillett connecting with Grace Wader, but were hampered by frequent miscues, giving the disc away to a Vortex team adept at getting off break looks. For much of the game, it was a give and take by each team: Bates received at the start and began a pattern of holds that both teams would carry through the majority of the first half. Cold Front first scored with a disc put into the hands of standout freshman Cameron Johnson, a primary receiver. St. Olaf answered with a score of their own, even as Olivia Gomez put on the defensive pressure that resulted in a foul in the end zone, one of several seen throughout the game as both teams played tight and active matchup defense. The next score from Bates came from a Gillett-Warder connection, before St. Olaf answered with Douglas finding Kaitlyn Mulhern in the end zone stack. Back and forth each team went, tying at 2-2, 3-3 and 4-4; turns came less on pressure from the defense and more from offenses struggling with execution, resulting in unforced errors as passes sliced into the ground or sailed just out of bounds in the blustery conditions. Handlers and cutters of both teams also found their cleats losing purchase in the muddied fields, particularly disrupting to the handler patterns looking to reset the disc. At 4-4, the flow of the game took a turn: St. Olaf scored the first break, another Douglas to Mulhern connection, with Mulhern laying out to snag the disc. After Bates scored to tie the game up at 5-5, an adjustment to the Bates’ game plan appeared: Gillett, an O-line handler, began to play defensive points in an effort to help generate turns. Gillett began taking the matchup against Douglas to try to stem the tide of around looks. As Bates coach Chase Baker said, “We threw a lot of people at her.” That included Johnson and Gillett, as well as a 3-3-1 zone defense for size. Yet St. Olaf held and then added one more break to take half 7-5.1 Just the day before, Bates had taken half 8-5 over St. Olaf, but Vortex was chugging on Sunday. “We never let the energy die…completely different than our game yesterday against Bates,” noted St. Olaf coach Sean Prichard. With an energized St. Olaf receiving to begin the second half, Bates looked like they were in serious trouble, unable to come up with an answer to the perplexing question of Douglas’ around break throws and downfield cutter motion. But Cold Front came back out in matchup defense and an interception by Adair Andre led to a perfectly placed huck by Gillett for a speeding Elizabeth Casey, reenergizing their sideline. Another pull, another series of back and forth turns, and Gillett found Casey once more to tie up the game. Vortex’s lead had quickly evaporated. But the pendulum of energy swung again in the direction of St. Olaf. A clean hold without any turnovers–the only point without a turn of the second half–concluded quickly after a centering pass to Douglas and backhand huck covering two-thirds of the field to find Mulhern open and ready yet again. The next point, a low throwaway by Gillett, gave Douglas chance to find fellow senior Marit McQuaig, and St. Olaf overtook the lead, coinciding with the soft cap. The game was to 11, with St. Olaf leading 9-7. Turns pervaded the next point, but Bates found the end zone after working it downfield. A beautiful break backhand from Libby Masalsky to Gillett set up another backhand break to Sarah King, tightening the gap to 9-8. That would prove to be the last point scored by Bates in the match, though, despite an impressive hand block from Gillett. And on St. Olaf’s game point, Douglas left her feet for a layout block on cutter Libby Masalsky. For the final time in the 2018 season, Douglas’ backhand broke her defender for a score to a striking Zielske for the title. Throughout the match, Douglas was the piece of the puzzle for which Bates could not find an answer; Douglas was involved in every St. Olaf goal, to the tune of nine assists and two goals. “Experience wise, with someone who’s been playing almost her whole life, at a very very high level for a long time…she was able to get throws off that hurt us, especially on the break side,” said Baker of Douglas’s performance. “We figured any point with Tulsa on helps,” said Prichard. As St. Olaf Vortex enjoys their National title, Bates Cold Front is also proud of their highest finish at Nationals in program history and begins looking towards the future: Gillett threw all eight of the team’s assists, of which seven went to underclassmen receivers. Comments on "St. Olaf Gets Sunday Revenge on Bates to Win National Title (Women’s)"